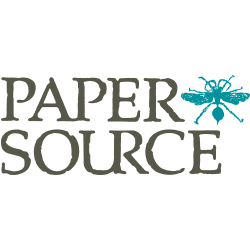 At Paper Source, we love to inspire customers to Do Something Creative Every Day. Whether its designing a custom invitation or creating a beautiful package with our gift wrap and ribbon or organizing your office with our exclusive calendars and planners, our assortment of gifts, fine papers, greeting cards, kits and personalized products are expertly curated to ensure any project is beautifully executed. We also know our customers love to celebrate special occasions, so we have designed an exclusive line of unique invitations and photo cards for big and small events. Our invitations use high-quality paper, digital and letterpress printing methods and feature our proprietary color palette. Behind everything we do is our exceptional customer service team and our knowledgeable store associates, who can assist at any of our 100+ locations nationwide. Whether you're looking for wedding invitations, birth announcements, holiday photo cards or party invitations, our distinct aesthetic and diverse offering are sure to inspire the day and our coordinating products will ensure every detail is perfect.